Autumn looks lovely for me because falling leaves are perfect for crafts. But we do not have autumn in our country, only dried leaves. I actually wonder how autumn would look like. I can only see them in movies and in pictures and I like how the colors of the leaves turn out to be. I am a leaf lover. I even have a leaf collection before. I don't know what happened to them since we kept on transferring from one house to another. I'd love to share with you a leaf art that I had been doing since I was a kid. But this time, I used it as a gift wrapper. What makes this beautiful is the personal touch it has because you will make your own wrapper. It is easy to do. 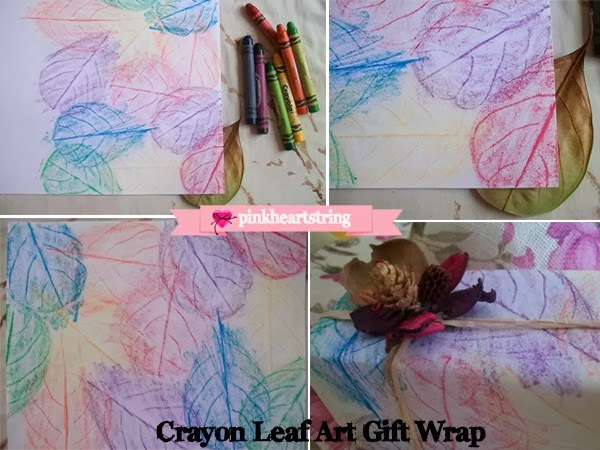 Just get a leaf you like or you can even get different kinds of leaves and place them under a paper. Then use crayons to color on the paper. You will see that the veins of the leaves will be traced on the paper. Use different colors so it will look lovely. 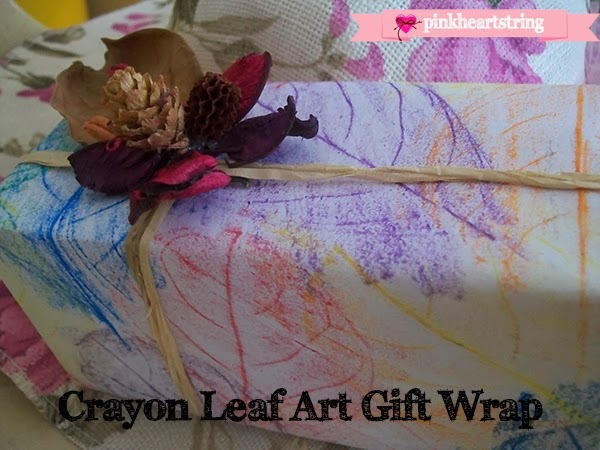 After making the crayon leaf art on paper, you can now use it to wrap your gift. Be creative with your design. I tied two rafia strings horizontally and vertically then I used a dry leaf and some potpourri instead of a ribbon. 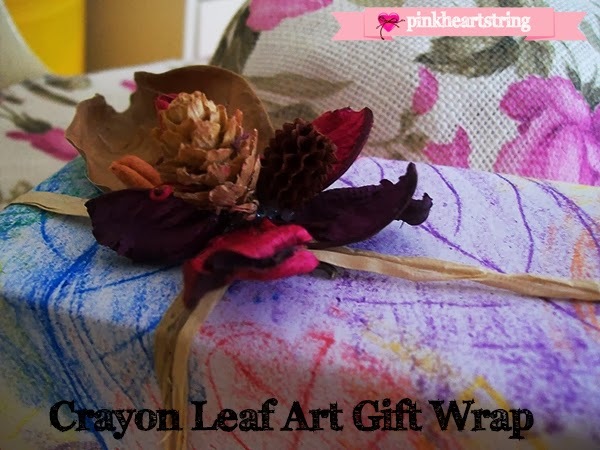 This is a unique way to wrap your gift and would be perfect for fall themed gift. Well you can actually use this for any occasion you can think of. While looking for leaves, I found a heart-shaped leaf. You know how I love hearts and so I used it to make another leaf art I also loved doing. I use pastels for this one. I trace the shape of the leaf and then using my fingers, I would scatter the pastel out of the shape to make it appear like glittering or something. You can use this to make your card or tag to pair with the fall themed gift wrapping we have above. We hope you enjoyed what I shared with you today! This post is part of the Sharing is Caring Thanksgiving Blog Hop hosted by Life With Lovebugs, The Jenny Evolution and, Chicken Scratch NY! All of the blogs listed below are sharing Thanksgiving or Fall themed posts as part of this event, so click on one or all of the links below to find some great recipes, tutorials, crafts and more! How pretty! I decided to make my own Christmas paper one year with potato stamps - it was a TON of work, but my gifts were wrapped beautifully! Great way to make a gift more personalized - making the wrapping paper! I love it! I love these ideas. How cute are they. I also love to receive anything handmade it shows you put a little extra thought into what you are giving. The bright colors are beautiful too. I remember as a kid making homemade gift wrap. Love this! What a fun idea to wrap the grandparent's Christmas presents! I love the paper! It's so pretty you hardly need anything else to dress up the package. I used to do something like this with my grandma when I was little, I'd forgotten all about it! Thanks for sharing! So pretty, I love how these turned out! 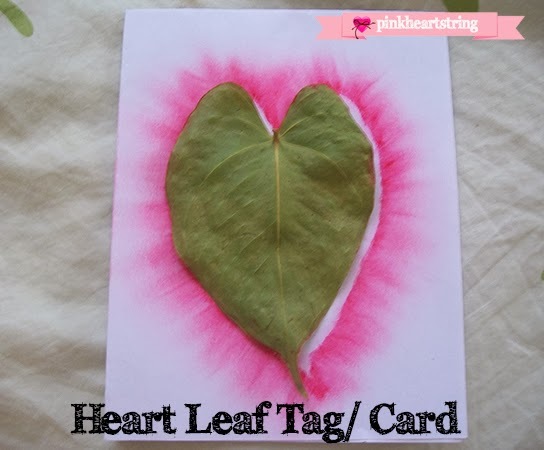 I especially love the heart leaf gift tag you made! Great job & thanks so much for sharing! So pretty, I had to pin two of the pictures to my Pinterest account. 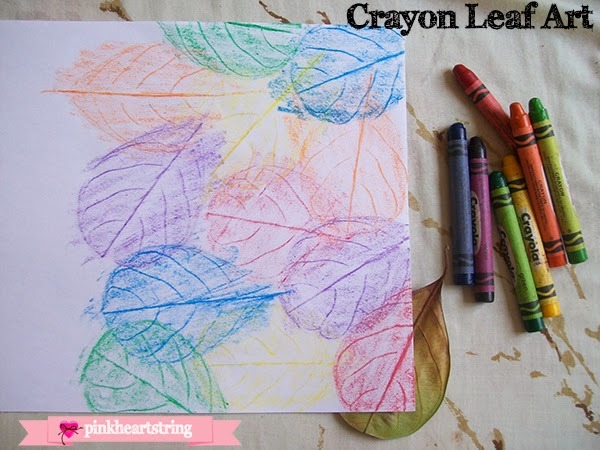 Leaves and crayons are so creative on paper. Great work. Happy #SCBloghop! I'm so glad you all liked it! Thanks for checking this craft and I hope you could use it on your own gifts too! Hugs to all! Thank you so much for sharing this fun craft idea!! How pretty! Maybe we will try this out later on! There are so many great leaves out there now! Thanks for linking up! I really like this idea of personalizing gift wrap. I wish you could have Autumn where you are! No matter the season this idea is great for adults and kids to try. Thanks for sharing in the SCBlogHop! How neat! I'm always looking for creative ways to wrap presents, especially for the birthday parties we get invited to. Thanks for the tips and for sharing on This Momma's Meandering Mondays!